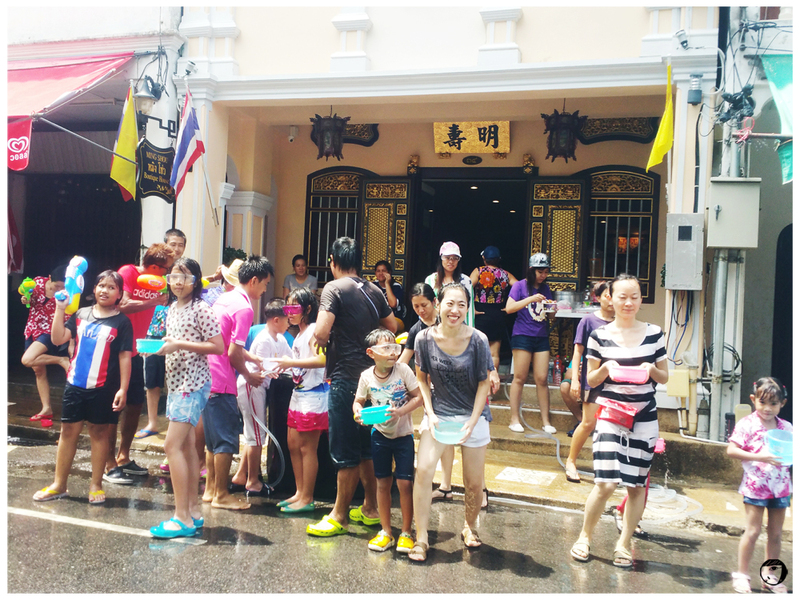 Finally, after exploring Phuket and the islands surroundings, it’s the time for Songkran! The festival was actually started on the 12th. After the relaxing sea-canoeing in the afternoon (read more about the canoeing tour here), we went back to our hotel, had ourselves cleaned up and head to Patong area to check on the water party. The trip to Patong by TukTuk was THB400. As we were getting nearer to the destination, the roads gradually changed from dry to wet and more people were seen wearing their raincoats and bringing water guns. 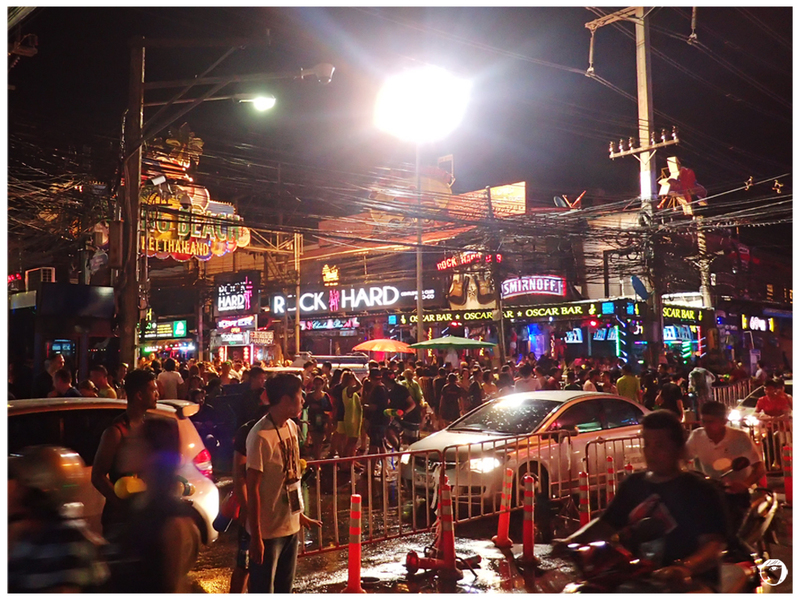 We knew, we would not be going back with dry clothes tonight..
We went to Bangla Road, the hippiest road in Patong or perhaps in Phuket. It was already full of crowds, mostly were foreigners. The celebration there was all about partying, loud music and crazily fun! As we entered the road, anyone just threw water at you and rubbed some minty powder to your face. Yeap, we were fully soaked from head to toe! Sadly, we did not bring our water guns that night. 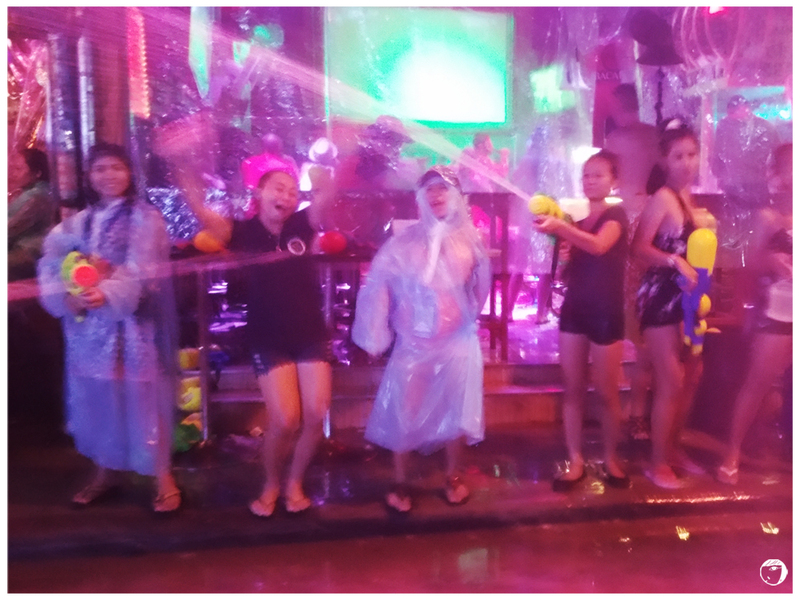 On the next day, we were ready for the real water fight 🙂 Fully equipped with our water guns, sunglasses and slippers, we decided to go to Phuket Town instead to join the locals. I love the place. The area features an exciting mix of old and new, the colourful blend of Sino and Portuguese cultures. 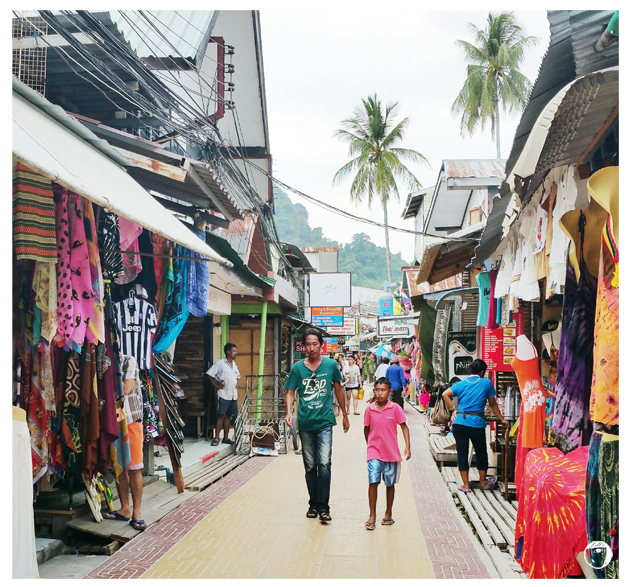 It is not as crowded as Patong, less night clubs, simpler but yet sophisticated. 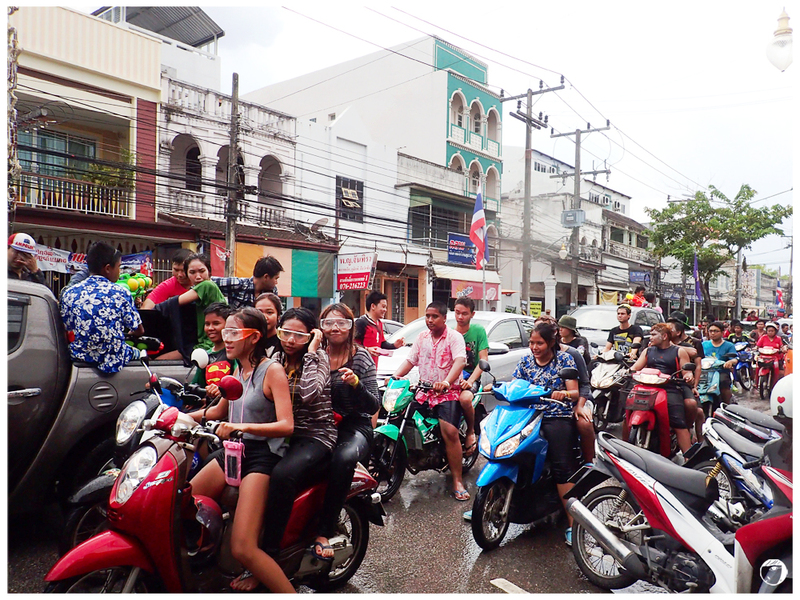 The celebration of Songkran in Phuket Town was more warming. The neighbourhood came together, giving blessings to the passerby, including us who are not locals. They would happily approach you, rub the minty powder or coloured washable paint on your face, another will pour another bucket of water on you and lastly said “Sawatdee-pimai!” (Happy New Year). I had so much fun, behaving like a small kid again, hiding and shooting water at the others as if I’m at a counterstrike field and getting free beers! I believe this is how the real Songkran all about ; the friendly water fight where people throw water to each other which they believe is a way to wash away all the bad luck from the previous year and substitute it with the good luck instead. And on the other hand it is a festivity of water guns, water cannons and buckets while the intense heat of summer is on. 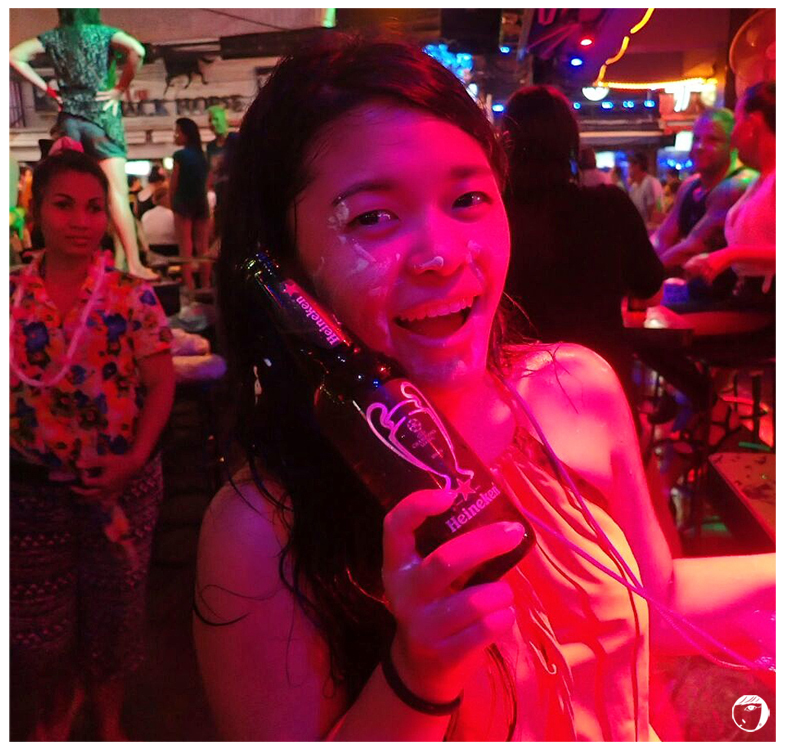 This month I had my short get-away to Thailand to experience the celebration of Songkran Festival 2015. 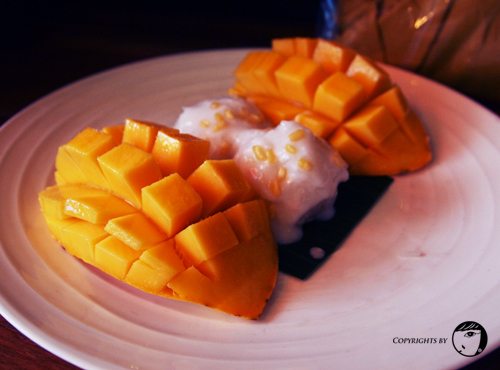 This year, the Songkran fell on April 13th-15th. 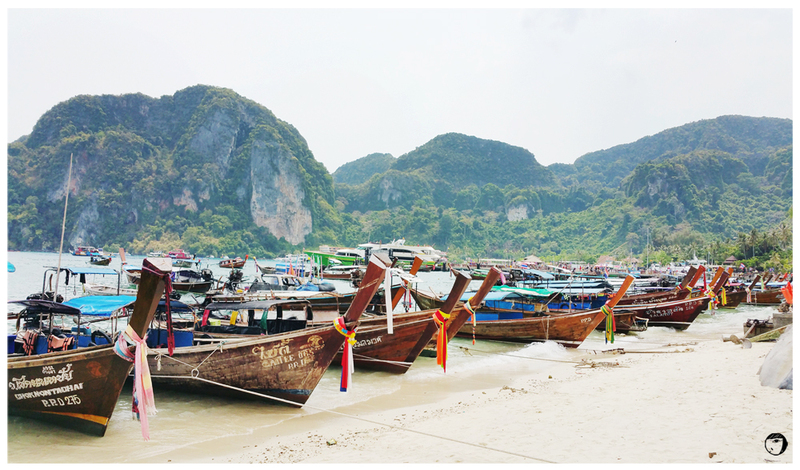 There are a few hot spots for Songkran Festival and I picked Phuket. 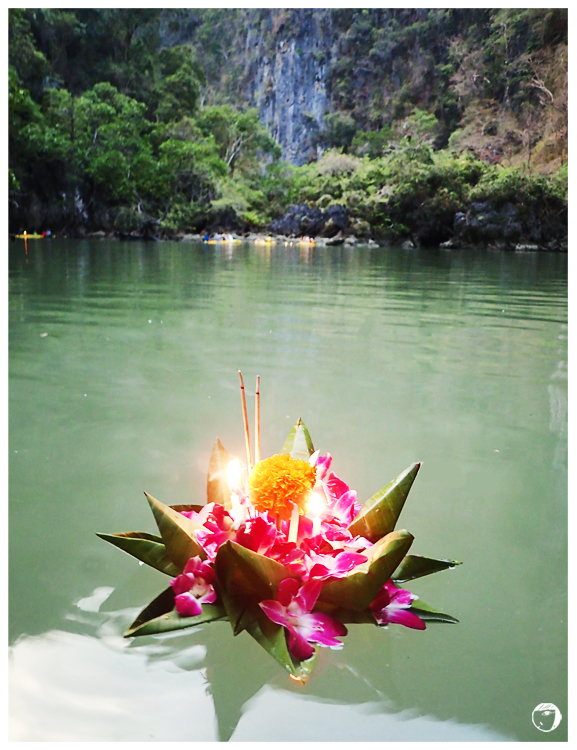 We flew to Phuket on April 10th, 3 days before the festival started. 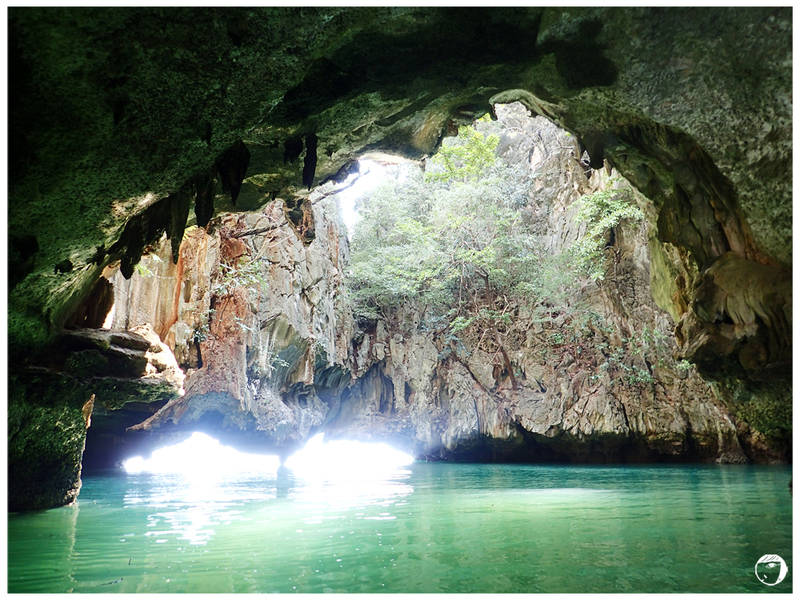 As Songkran was still a few days away, we decided to do what is a must-do in Phuket : ISLAND HOPPING TOUR! I’m very excited about this activity, to explore the stunning rock formations, to jump into the turquoise waters and snorkel. We had the tour booked through online. The tour fetched us at about 9AM at the hotel. Then we hopped onto the speedboat, together with the rest of the tour members. Our first stop was Mosquito Island. The journey to Mosquito Island was about 1 hour. It was not a smooth sail, so it’s good to prepare a motion-sickness medicines. 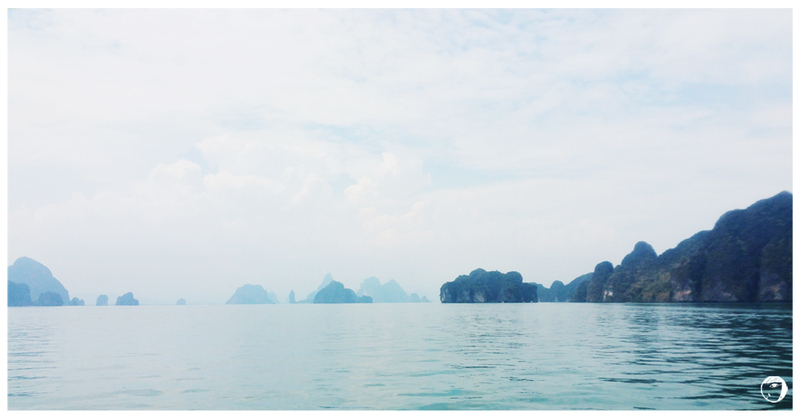 At the Mosquito Island, we could snorkel over the view of the stunning rock formations. The water is tranquil turquoise, clear.. Perfect! 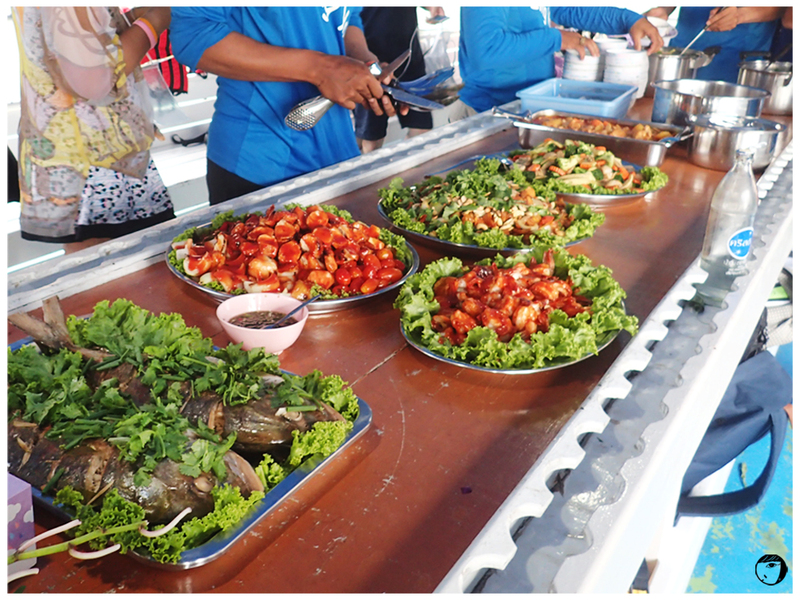 After our stop at Mosquito Island, we head to the Bamboo Island and one of the beach side restaurant to have our lunch. The beach at the Bamboo Island was similar with Boracay beach, soft white sands with clear water. There were not many tourists there yet too, a good place for relaxing. It was a quick lunch (Lunch was provided) and we did not have time to explore much of the island as we had a few more islands to explore. Monkey Beach and Viking Cave were next. 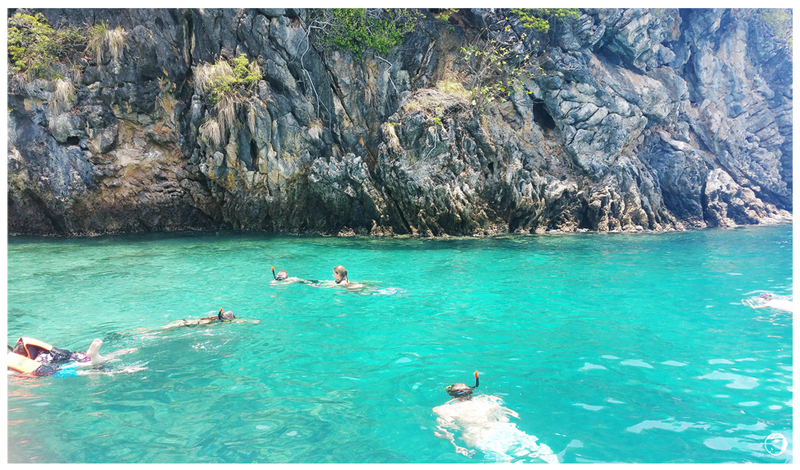 But we did not stop to snorkel at those 2 islands. Our guide explained that the monkey at the Monkey Beach are long-tailed species, crab-eating monkeys. So they can swim and survive in the water. 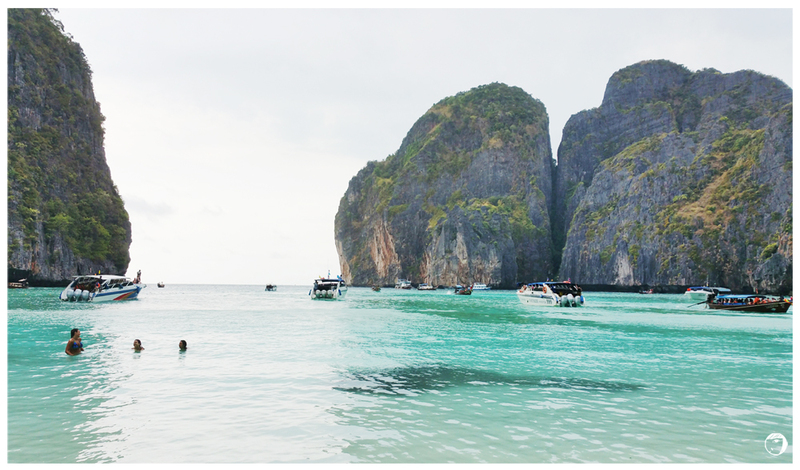 The highlight of the tour was the famous Maya Bay and the Pileh Lagoon. I love Pileh Lagoon the most. 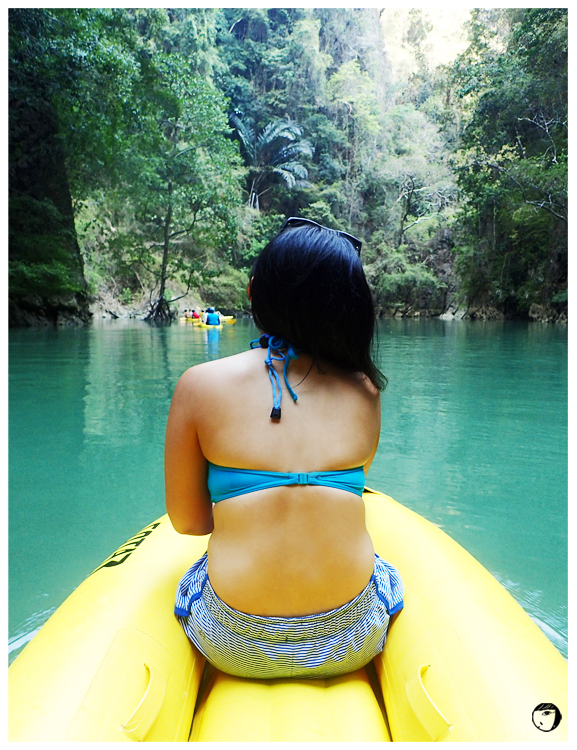 The entire scenery took my breaths away. It was probably one the most fascinating places on the Earth. 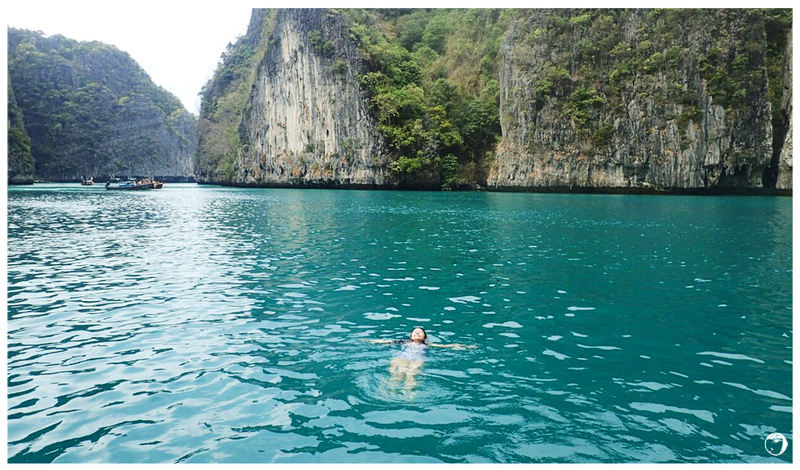 We can swim in its warm, turquoise calm water. The water is 20-metre depth. 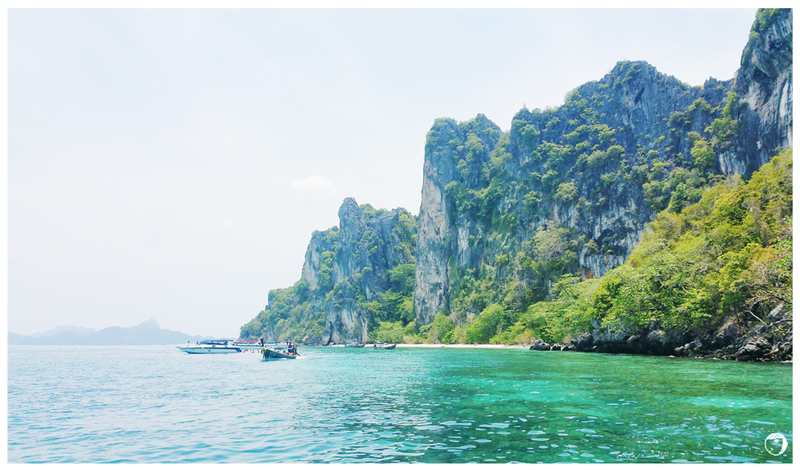 To take a jump from the boat into the emerald green waters was definitely one of my best moments during this trip. 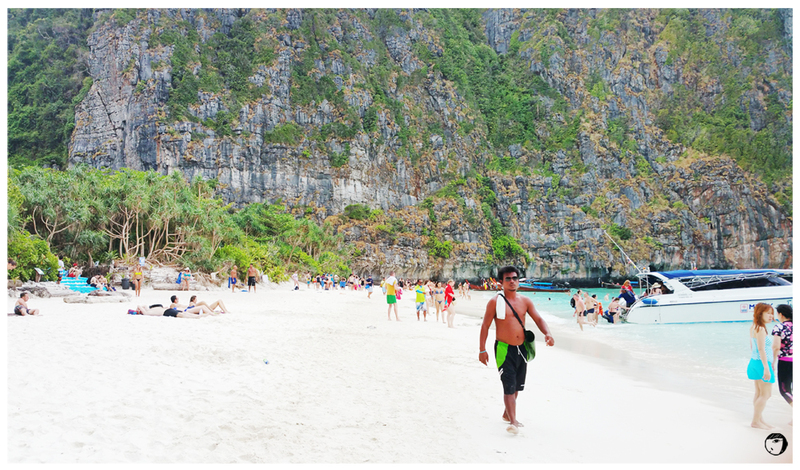 Maya Bay, the main tourist attraction of Phi Phi since The Beach was filmed here in 1999. 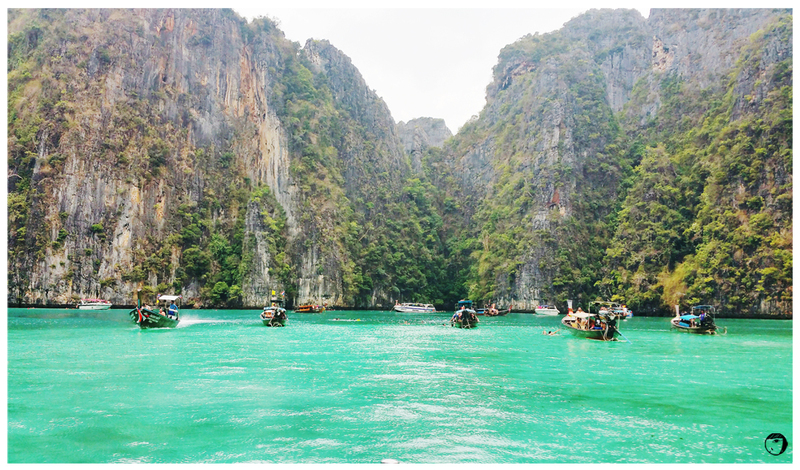 It has been always very popular even before the film but now people around the world who haven’t even heard of Phi Phi have certainly heard of Maya Bay. 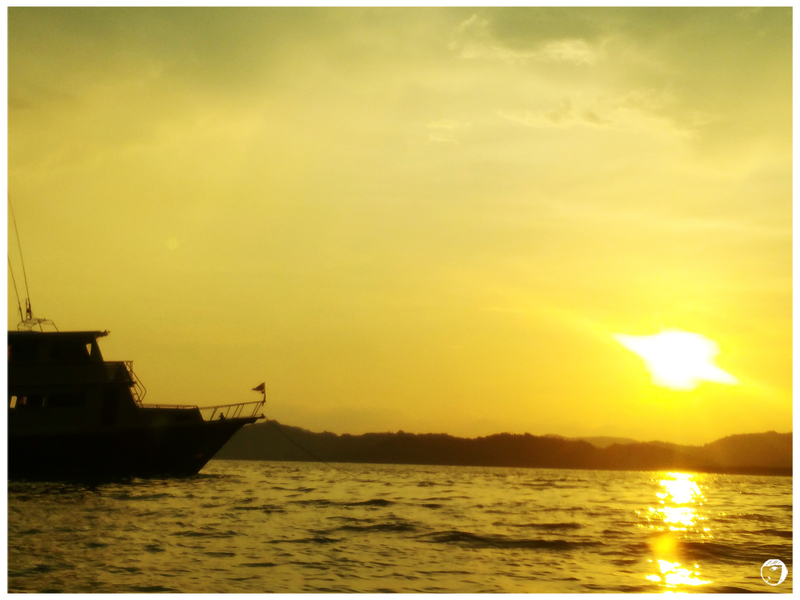 The view was expectedly stunning, but the beach get overcrowded especially during holiday season. 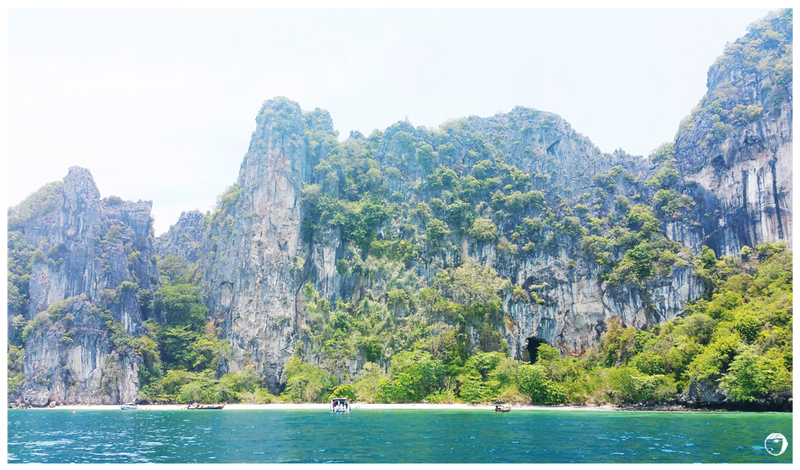 Writing this blog post remind me of the whole island hopping trip. 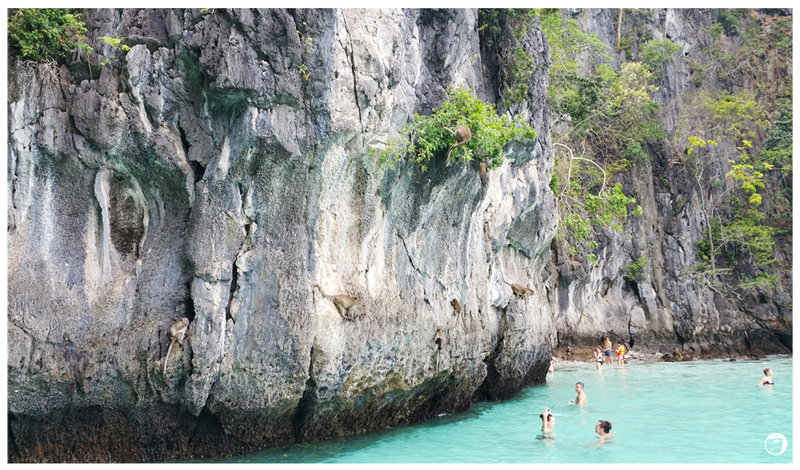 How warm the water was, how soft the sands was, the ocean breeze, emerald turquoise water, the magnificent rock formations, everything about the place… Oh, Phi Phi you had me now! 1. Prepare the sea-sickness pills before hopping onto the boat. 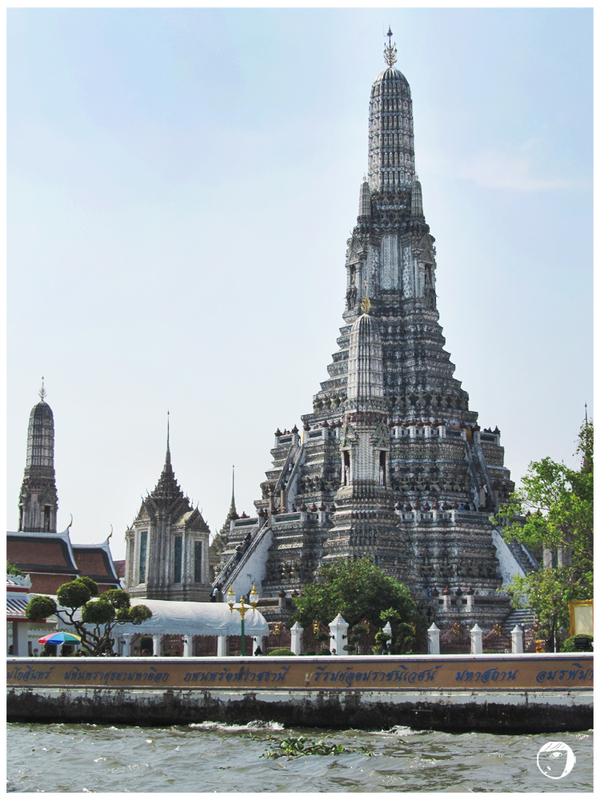 The Temple of Dawn, or the locals called it Wat Arun, is a Khmer-style Buddhist temple sitting at the Thonburi of Chao Phraya River. The temple is also one of Thailand’s landmarks. 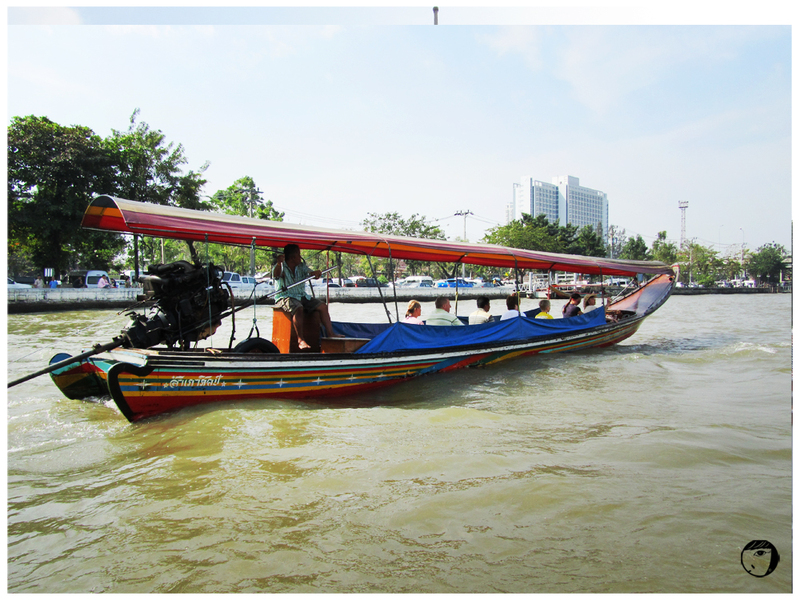 To reach the temple, we boarded the ferry and travel across the Chao Phraya River. The ferry runs every few minutes from Tha Tian (Tian Pier). Don’t expect the water of Chao Phraya River to be clear 😦 But sailing over this Bangkok major river was another very exciting experience. The temple opens daily from 08.30 AM to 5.30 PM. The admission fee is 50 Baths. We don’t have to worry about the dress code here unless if you want to visit the Ordinary Hall. Visitors can climb up the tower to see the view of Bangkok. I did not join my parents and my brother climbed up. Not because I’m a acrophobia or fear of heights, but because the stairs are very steep and the shoes I was wearing was slippery. The special features of the temple is its 67m-tall grand pagoda or in Thai, called ‘prang’, decorated with broken multihued Chinese porcelains. It is surrounded by four smaller pagodas. – Take BTS Skytrain to Saphan Taksin (Silom Line), take exit #2 and go to Chao Phraya River Express Boat Pier. Then board a ferry heading to Tien Pier (#8). Ticket price for cross-river ferries is 3.50THB. After the Temple of Reclining Buddha or Wat Pho, our local tour brought us to the Temple of Emerald Buddha or Wat Phra Kaew. 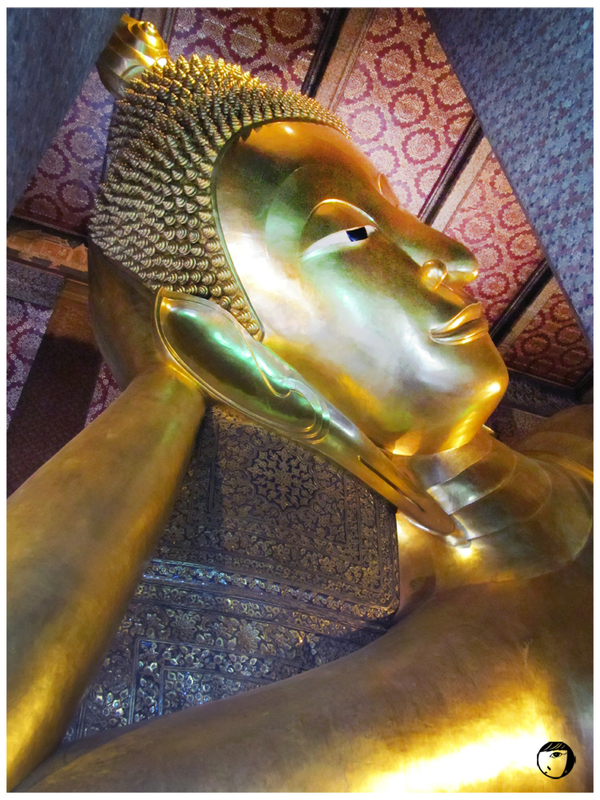 If Wat Pho is the oldest and the largest temple in the city, Wat Phra Kaew is the most sacred temple. 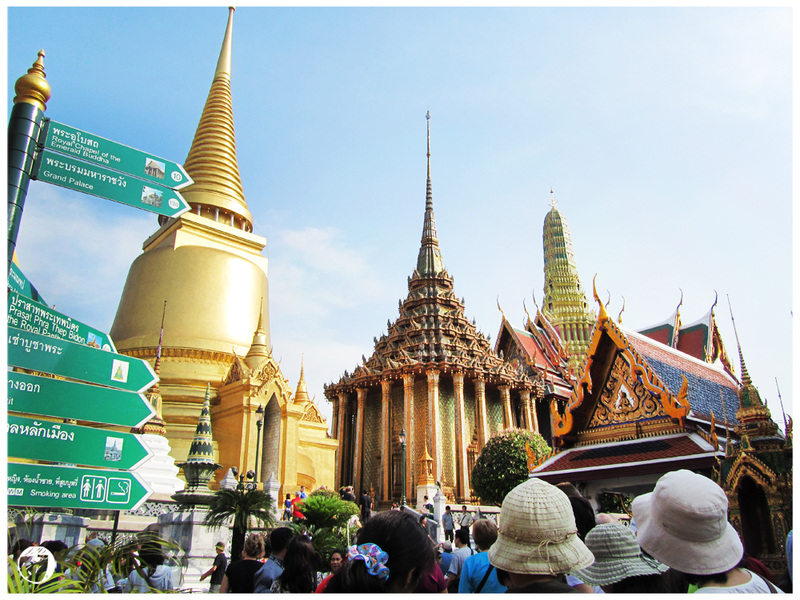 The temple was located inside the Grand Palace in the Banglamphu area of Bangkok, also known as the Old City. 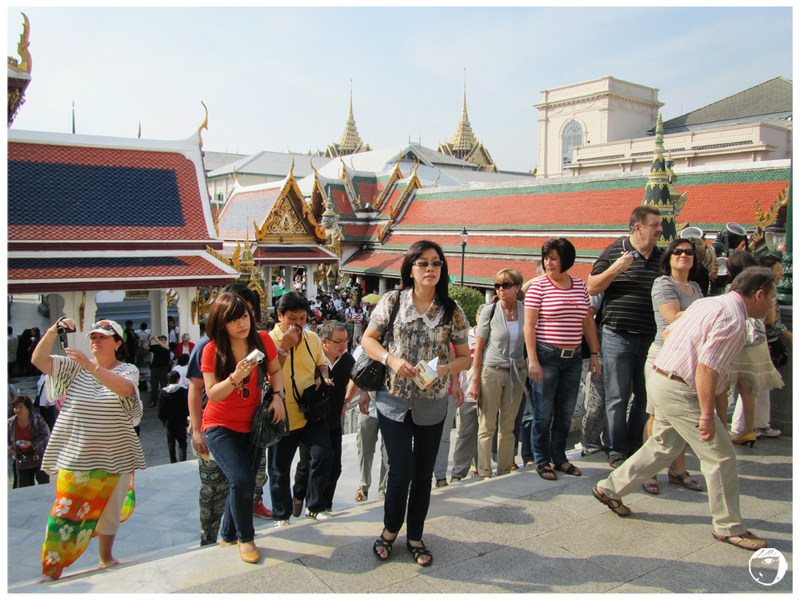 They are must-go tourist destinations in Bangkok. The place opens from 8.30AM – 3.30PM. If you are not together with a tour, it’s good to reach here early. Since it is a top tourist destination, it always crowded. The entrance fee is THB350 (this was in 2011). Personal audio guides in English, French, German, Spanish, Russian, Japanese or Mandarin, are also available for rent at THB100. If you who were to visit temples and the Grand Palace, it’s better to wear a proper attire (no shorts, mini skirts, tights or sleeveless shirts). Visitors were not to expose any skin, including arms, lower legs and toes. Visitors who dressed inappropriately required to rent suitable clothing. My brother wore a shorts and had to rent a long pants before entering the palace. Despite its function as a sacred place for people to pray, the number of tourists who payed a visit here is bigger. All I could hear here were the sounds of the microphone of the tour guides buzzing everywhere. The architecture inside the compound was what amazed me. 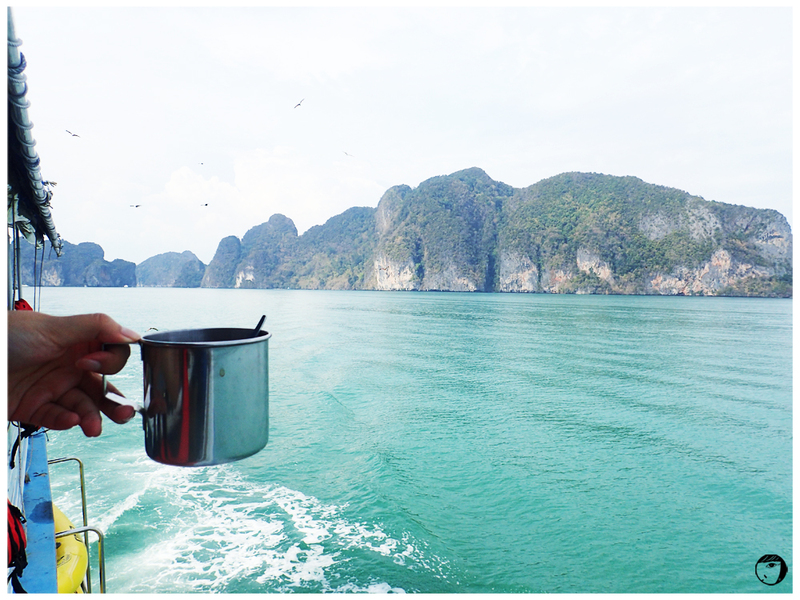 You could see Thailand everywhere. 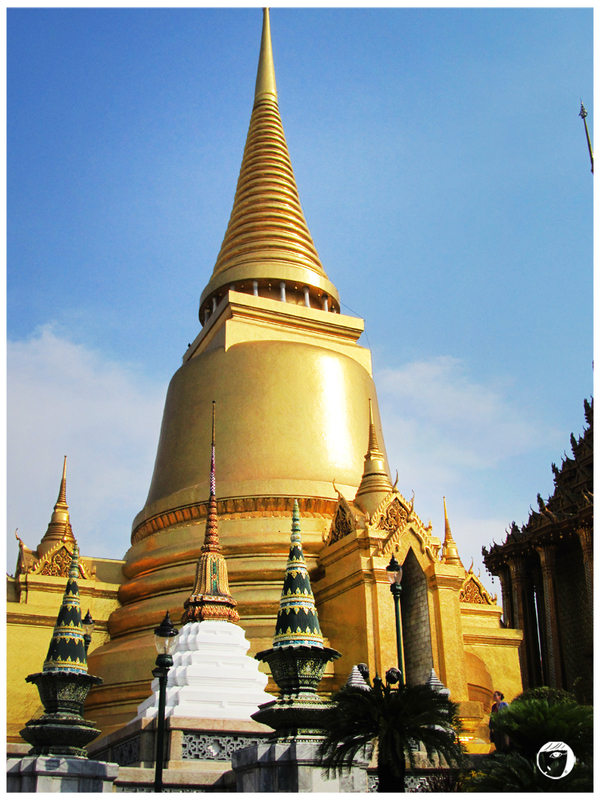 We saw the gold plated stupa roof which is also the trademark features of Thai building. Because of the crowd, it took sometime to move. Because of the distinct colourful stupas and building, people were busy taking pictures. I was not surprised that we had to take turns to take photos in some favourite spots. 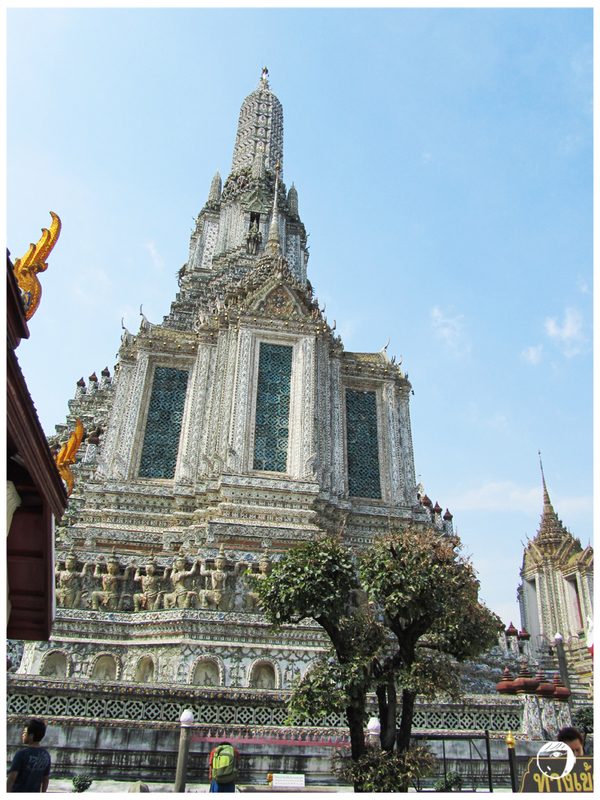 Just like its name, Emerald Buddha was made of jade. It was believed to be originated from Sri Lanka and this Buddha image was so important that only the King himself is allowed to touch it. The King changed the image’s robes in three times a year in the hope for good fortune. 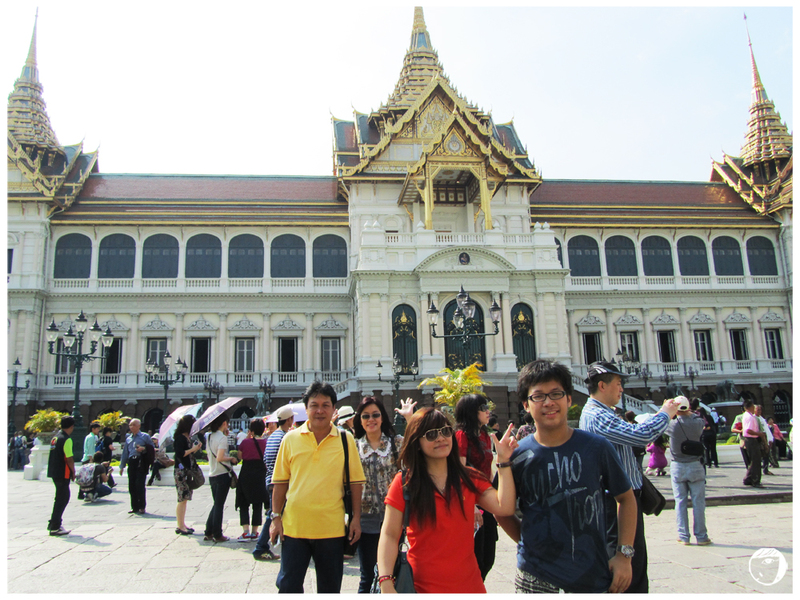 After our visit to the Temple of Emerald Buddha, we headed to the main part of the Grand Palace. It is the area where the most important residential and state buildings are located. 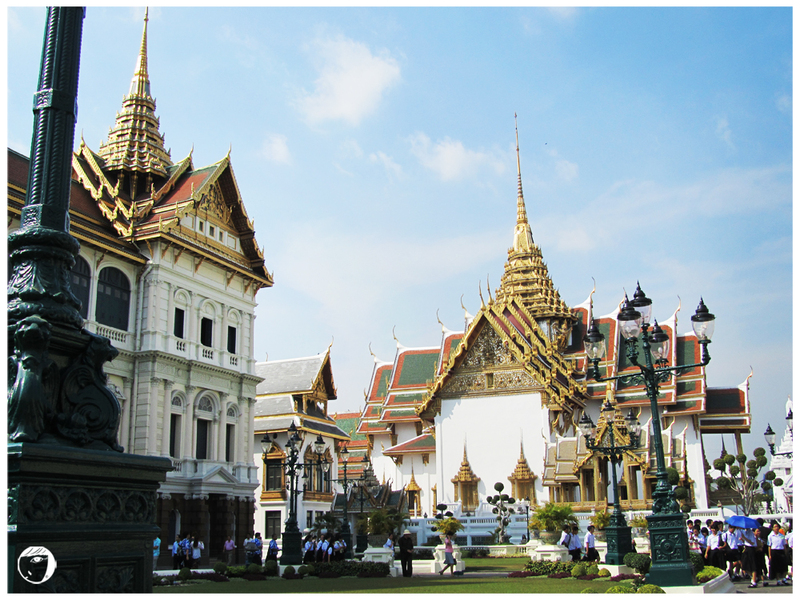 The most recognisable building in the Grand Palace was, Chakri Maha Prasat Throne Hall. 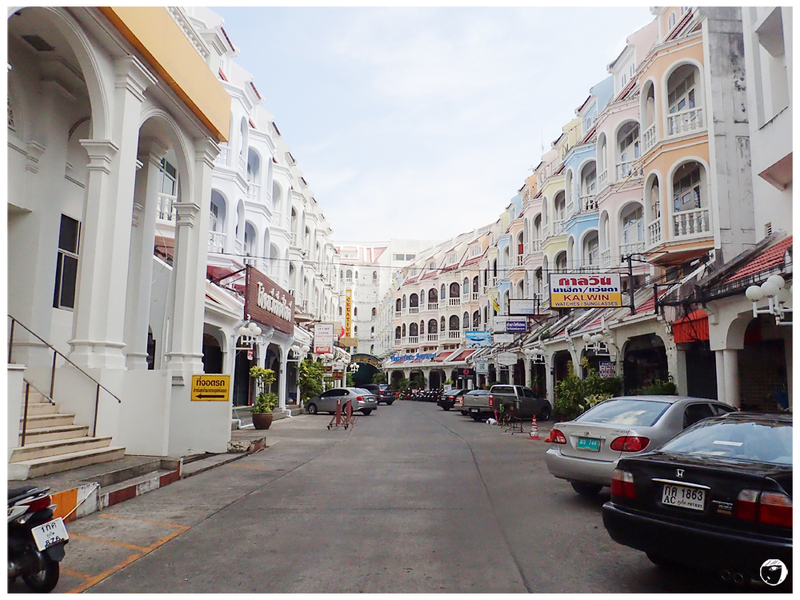 The architectural style is a blend of Thai and European style. Notice my brother’s style-mylo rental pants? After touring the Grand Palace, we went out from the main entrance, the Wisetchaisri Gate. There, you can post with the stoic soldiers who guard the palace and stand rigidly with bayonets fixed, just as with the famous London Beefeaters! This whole Bangkok trip was done in 2011. I know it’s 2014 and in 3 years times, the city would have done changes here and there. But sharing it here is always a better option than just keeping it as a storage in my drive. 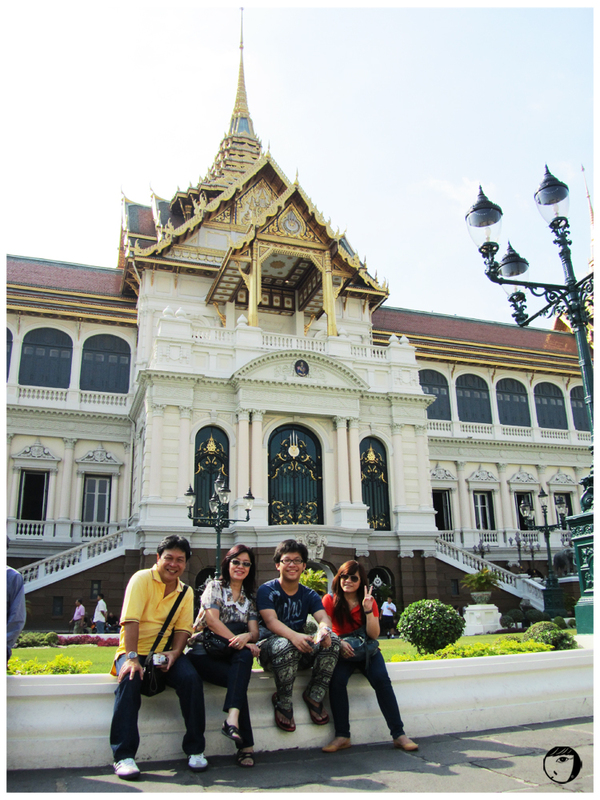 It was my first time visiting the capital of Thailand and I did the trip with my close ones, my parents and brother. 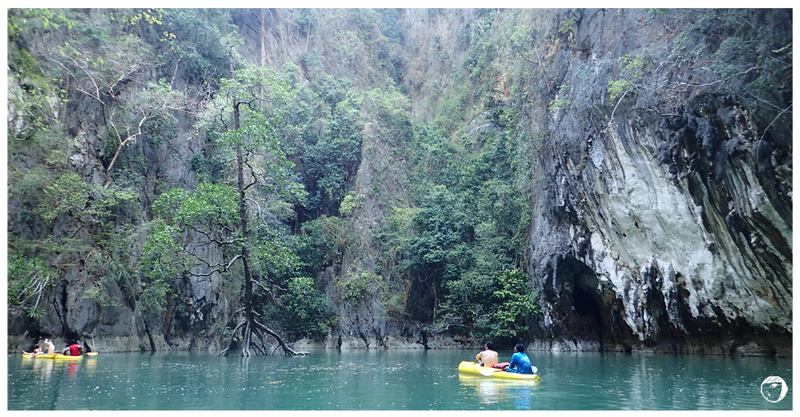 It was a 4D3N trip… Considering we were strangers to the city, taking a one-day local tour was a good decision. The tour started early in the morning. We were picked up from our hotel, Novotel at Siam Square, at around 7AM. Our tour guide was a local who is fluent in Indonesian language. Please be considerate for me not being able to recall his name… It was 3 years ago and I’m not good in memorising names. 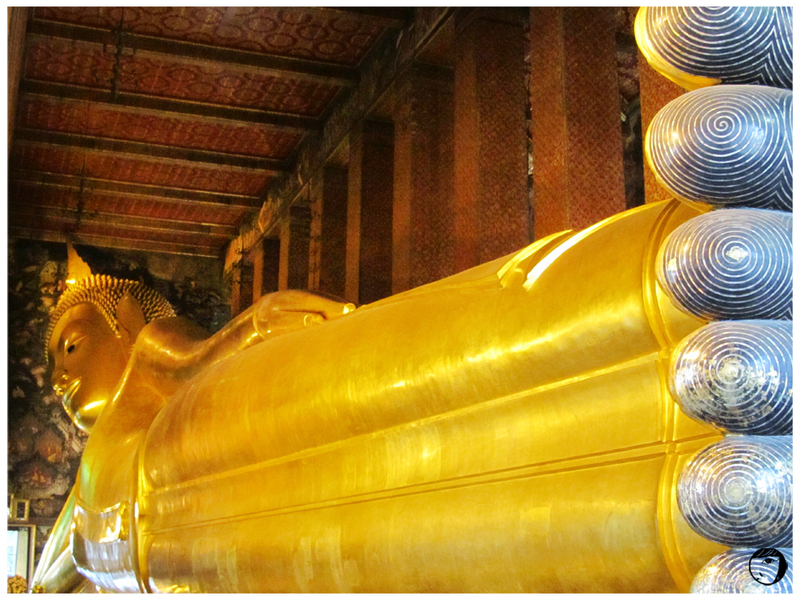 The famous site we visited was the Temple of Reclining Buddha, or Wat Pho, Wat Phra Chetuphon. 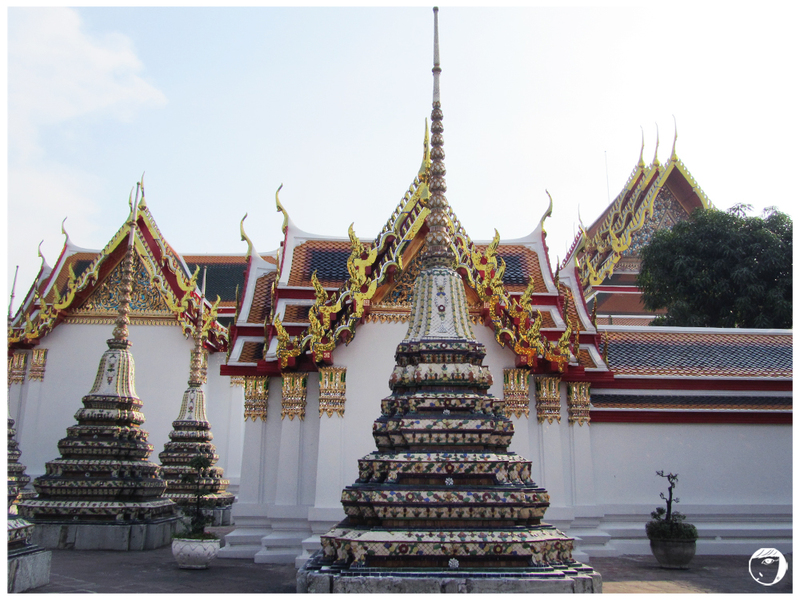 It is also the oldest and the largest temple in Bangkok. The statue is not the only Buddha image, in fact there are thousands of Buddha images in the temple. Walking into the compound of the temple, visitors will see stupas or chedis. Finally, we reached the Reclining Buddha. It was huge! The statue is 150 ft long and 49 ft high. It is indeed the largest Buddha in Thailand. After struggling to find the best angle to fit into my camera screen, this is how it looks like. Along the corridor, bronze bowls are placed. There are 108 bowls in total indicating the 108 auspicious characters of Buddha. People usually drop coins in these bowls as it is believed to bring good fortune and also to help the monks maintain the temple. Though there will be a lot visitors, but inside the Buddha statue hall is serene. It’s expected visitors to respect the people who come here to pray. We took the last flight from Singapore and reached Bangkok quite late. It was only in the last-minute that we decided to go clubbing that night, since we did not want to waste one of our nights there. So after checking in our hotel at Siam Square, we went to Route 66 Club (RCA) at Rama 9 Road. Be careful of those taxis who wait in front of the hotel. They purposely did not want to bring us to our destination and tried to bring us to a club named “Disco” (if I wasn’t wrong). The name sounded suspicious so we rejected them and decided to wave at the taxis on the main road. I’ve heard that it is better to wave at taxis on the main road than taking those who purposely wait/park their taxis. These drivers are those who always cheat tourists. We had so much fun at the club. Route 66 Club (RCA) play the latest top hip-hop/dance songs, together with laser shows. The crowd was on 20’s-30’s, mix locals and foreigners. The next morning, we woke up quite early to go Chatucak Market. Since we stayed awake for the night, we were starving, so we tried to fill our stomach first. It was quite confusing since the market is very big. 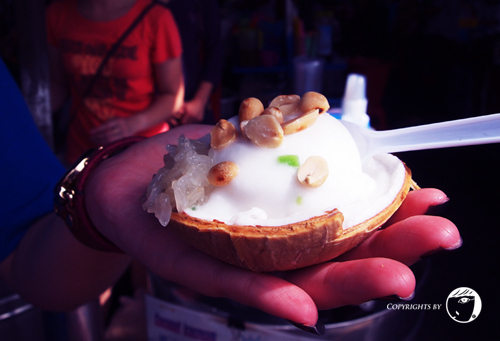 A nice and refreshing coconut ice cream, served on the coconut shell.
. The road is full of Caucasians since it is a backpackers area. At night we decided to walk around our hotel at Siam Square area and we had our dinner in one of the restaurant there too. 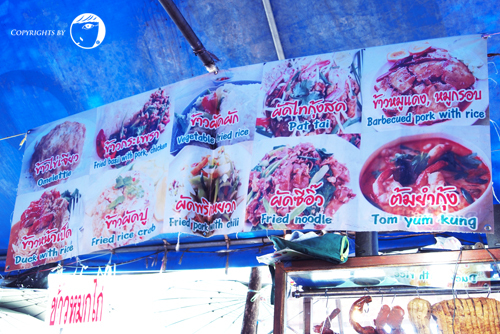 We had Tom Yam, Papaya Salad, Thai Red Duck Curry and Sweet Tapioca with Coconut Milk. 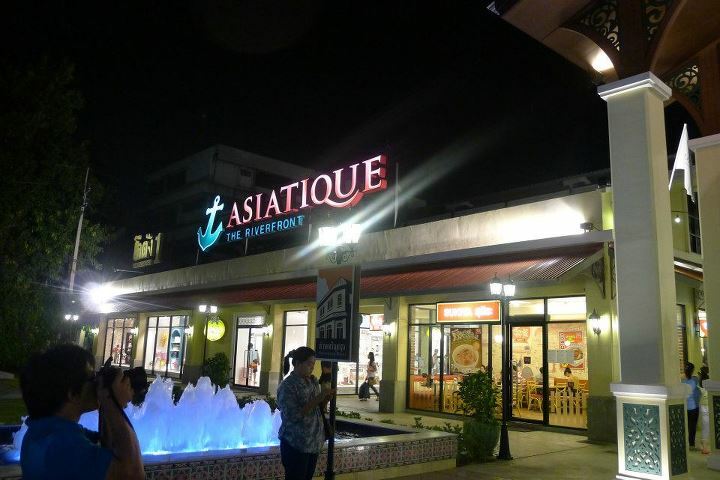 At night we went to Asiatique the Riverfront, a new outdoor entertainment and shopping complex at the side of Bangkok’s Chao Phraya river. The place is amazingly beautiful. You won’t feel like you are in Asia countries. The place is still relatively new therefore not much tourists come here. 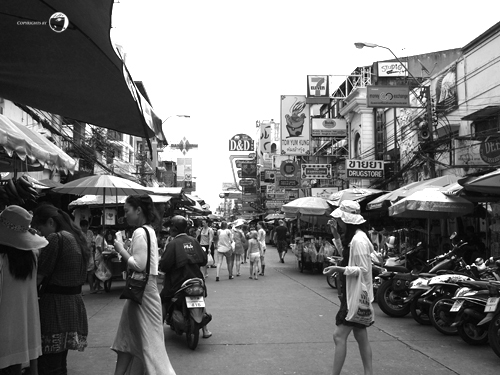 On the next day, before we went off to airport, we still had sometime to explore Bangkok. So we went to Platinum shopping mall. 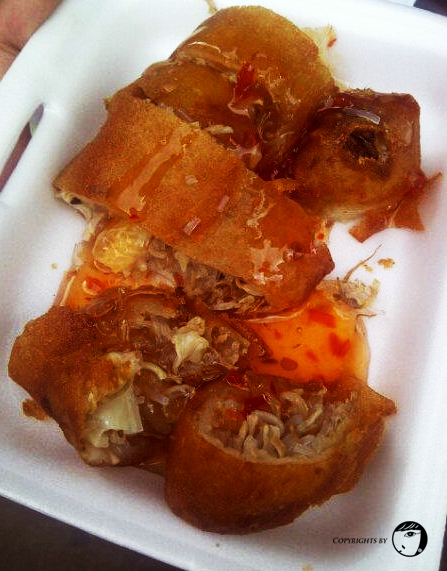 We had our breakfast at the food stall nearby hotel. We had Noodle with Tom Yam soup and Thai Beef Noodle. It was only a short get away, but we felt satisfied because of the good food and shopping time. Mission accomplished! Take the train to Chatuchak Park station (exit #1), then walk across the park until you arrive at the entrance.